Save Girl Child Quotes i.e. inspirational quotes and slogans for saving girl child and fighting against female foeticide. So if you are searching for save girl child quotes and slogans, now you don't need to search for them anymore. 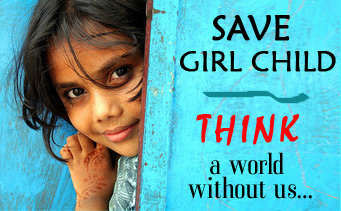 As here I have compiled some of the best and inspiring quotes on saving girl child. Just hope you will like the quote compilation and learn something new from here. Our daughter is the knot that ties the family together. The beauty of a girl cannot be mimicked, fabricated or created by human means, it only occurs naturally. The baby's beauty lies on its' pure-hearted. Little girls dance their way into your heart, whirling on the tips of angel wings, scattering gold dust and kisses in our paths.